It is increasingly necessary for automotive manufacturers and their suppliers to meet the objectives of the ISO 26262 standard. As a result, engineers of active and passive safety systems within cars must take this standard into consideration when developing automotive safety applications. 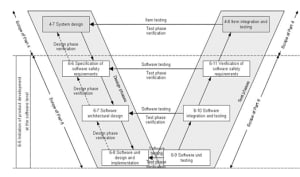 To streamline the process, it may be possible to employ a model-based approach for embedded software controls in these systems, including automatic and certified code generation, that meets the requirements of ISO 26262. This white paper presents an approach for the development of ISO 26262  compliant software applications based on Model-Based Design (MBD) and certified Automatic Code Generation (ACG). Complete the form on this page to download your free white paper. Your download is sponsored by ANSYS.